Originally written for Counterfire.org. 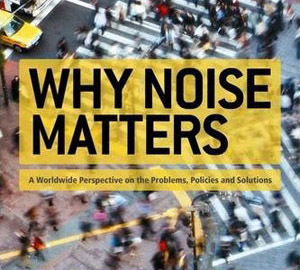 A review of Why Noise Matters,which explores an important but often ignored environmental problem, the causes of which are intertwined with consumer capitalism, and its impact upon people’s lives is as much a class issue as many other such issues. John Stewart, with Arline L. Bronzaft, Francis McManus, Nigel Rodgers and Val Weedon, *Why Noise Matters: A Worldwide Perspective on the Problems, Policies and Solutions* (Earthscan 2011), x, 174pp. This litany of experiences is not the product of a condensed timeline, nor of the imagination. They all took place within a 24-hour period as I began reading John Stewart’s *Why Noise Matters* (other experiences have been left out, such as screaming kids on the plane — we were all wailers once). Many of the authors in *Why Noise Matters* have experiences with noise pollution, which, in some cases, has led to lifelong campaigning roles against the blight. According to the World Health Organisation, noise is the pollutant which disturbs more people in their daily lives than any other. Such disturbance can lead to poor health outcomes, fractured community cohesion, and, as American noise scholar Arline L. Bronzaft notes, is implicated in violent behaviour and even murder. As numerous studies show, including the Chartered Institute for Environmental Health’s annual *Noise Survey*, things are only getting worse. Yet there are few countries with a strategy on tackling noise. The authors are particularly critical of New Labour, who both early on in their government and again in 2006, made promises to tackle noise pollution, but never delivered. As Stewart writes, for most of the world’s policy-makers, noise is ‘the forgotten pollutant’. So when does sound become noise? The question seems simple enough, but contributes to the difficulty in tackling noise pollution: while sound is a measurable entity, noise is a subjective experience of that same manifestation, and subjective experiences are notoriously difficult to legislate. There are, however, general guidelines and studies that identify thresholds. At around 50 decibels people begin to get annoyed with daytime noise (at night, it is 30 decibels). At around 55 decibels (a 10 decibel increase represents a doubling of sound levels) people become extremely annoyed. Above 130dbs is the human threshold of pain, although the gradual loss of hearing from continuous noise is a greater worldwide problem. One of the strengths of *Why Noise Matters* is that it offers up noise pollution as a global phenomenon. While its research is not (and does not claim to be) comprehensive, this global approach highlights the inequities in experiences of noise pollution between rich and poor, industrialised and industrialising, and asks why more is not being done to tackle noise as a social injustice. Noise is, as are other forms of pollution, a class issue. For example, the authors write that there are ‘fascinating signs [that] where the consumer society has become embedded… a growing number of people not only accept noise but see it as something positive because it is associated with the consumer goods they value. It is not noise that disturbs them, but silence’ (p.9). The authors rely on Michael Bull’s 2000 *Sounding out the City*, where Bull conducted a number of interviews with people about the attachment to their iPod, as well as on works such as Oliver James’ *Affluenza*, and the contention (not new) that we define ourselves through our possessions. The authors could have given more time to following these lines of enquiry, particularly those offered by Stuart Sim (2007) in his *Manifesto for Silence*, who argues that noise is a key commodity in the culture of business, and again benefits the rich rather than the poor. Sim shows how noise/sound is used to sell food and drinks in restaurants and supermarkets, employed as a marketing tool. ‘Noise sells’ says Sims. But why? And who does it benefit most? The book is in the end a call to action, and offers both broad and specific responses to the problem of noise pollution. Most easily tackled are the key problems of traffic noise annoyance, which could be cut by 70% through investment in electric and hybrid vehicles; rail noise (through polishing and better engines); and, more problematically, neighbour noise, through both local and national governments taking anti-social behaviour seriously as a health issue. More difficult areas to tackle are aircraft noise (due to continued expansion), shipping, wind farm noise, and, most challenging of all, industrial noise in the industrialising countries of Asia, Africa and South America. However, the authors warn, the total amount of new cars being built globally could outstrip all improvements made in these areas. But there is hope. Of all the countries that have taken the issue of noise pollution seriously, China and Hong Kong, who have implemented intelligent legislation on, for example, new road building projects, are key models for the rest of the world to follow. Whether our more industrialised and ‘sophisticated’ governments will follow suit remains a challenge for noise campaigners and those of us who, quite simply, want a quieter and more peaceful life.